The homemade queen of hearts costume involved a red dress with glued hearts on it and a corset over it. The corset had glued gold trimmings. The stockings were purchased online and were the same as in the movie. The wig was from a discount store. I sewed the hair using clear thread into an up-do. 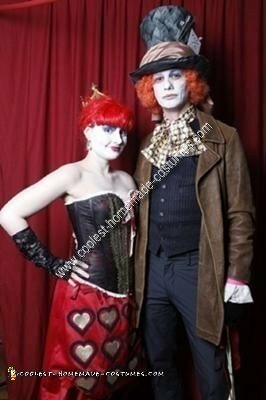 The homemade mad hatter costume had lace glued to the coat sleeves. The hat was covered with fabric and a sash and the bow tie was fabric glued together. The wig was from a discount store.